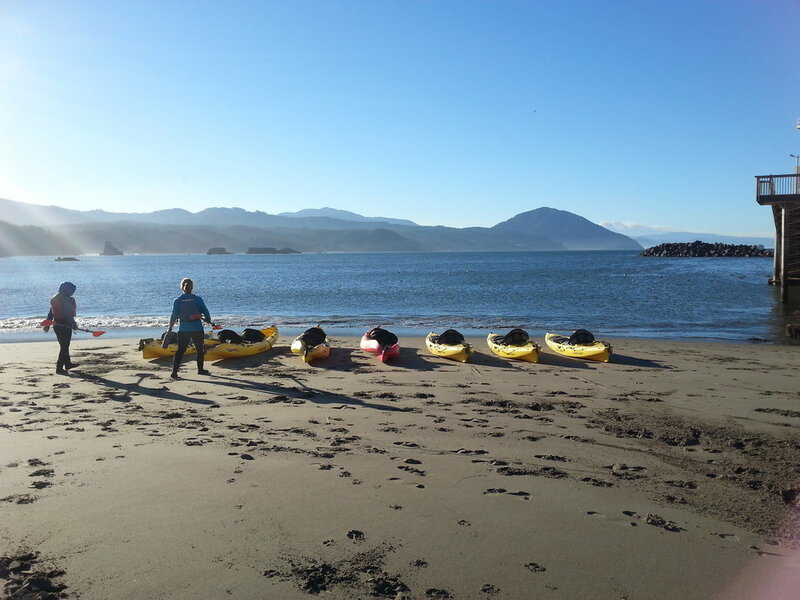 We have visited Port Orford many times, taking in the sweeping vistas of the beautiful rock formations and crystal blue water from the viewpoints. It is really breathtakingly gorgeous with what feels like untouched shoreline and not many people around so you often feel like you have it all to yourself. 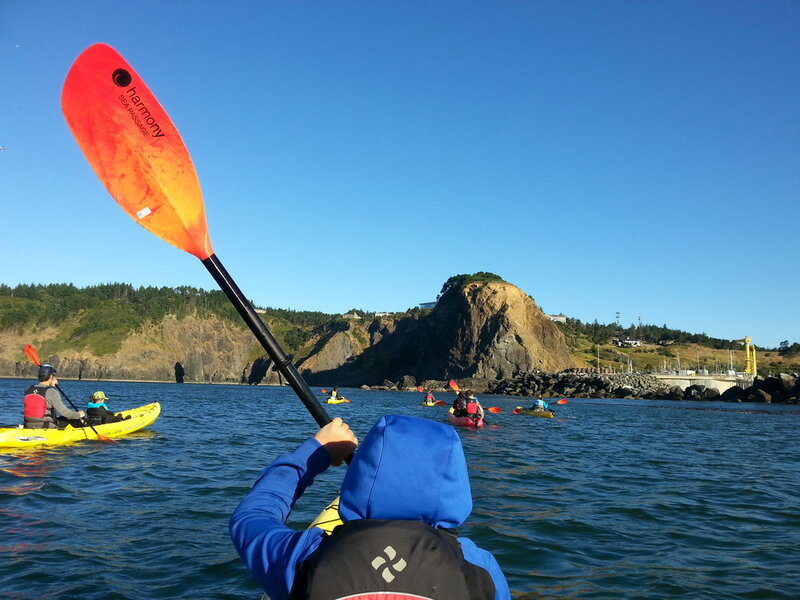 When I ran across South Coast Tours - Port Orford Heads kayaking tour I thought it would be a new unique way to explore Port Orford heads and would be fun to take Ilias and Olivia on a new adventure that they would remember for the rest of their lives. When we got there we were greeted by our tour guides Anthony and Alison, then we were told to suit up! I don't know why I expected a sweatshirt and track pants would be appropriate clothes to wear out in the Oregon coast Pacific Ocean but yep that is what we wore so when we were handed a full wet suit, including booties, waterproof coat and life jacket we were so happy to have the warm gear on once we hit the water. When we got down to the shore we were instructed by Anthony and Alison how to paddle and use the rudder. Both Gary and I appreciated that our tandem kayaks had the rudders, making it much easier to steer in what ended up being a pretty rough day out on the ocean. I'm not sure what my expectations were once we got out on the water, but I will tell you this, kayaking on the ocean is way different than on a river or lake. The day we went was pretty windy so the swells got pretty big, plus it is more gorgeous than I can describe; the water is all sorts of different shades of blues and greens along with the iridescent yellows and greens of the seaweed and kelp. 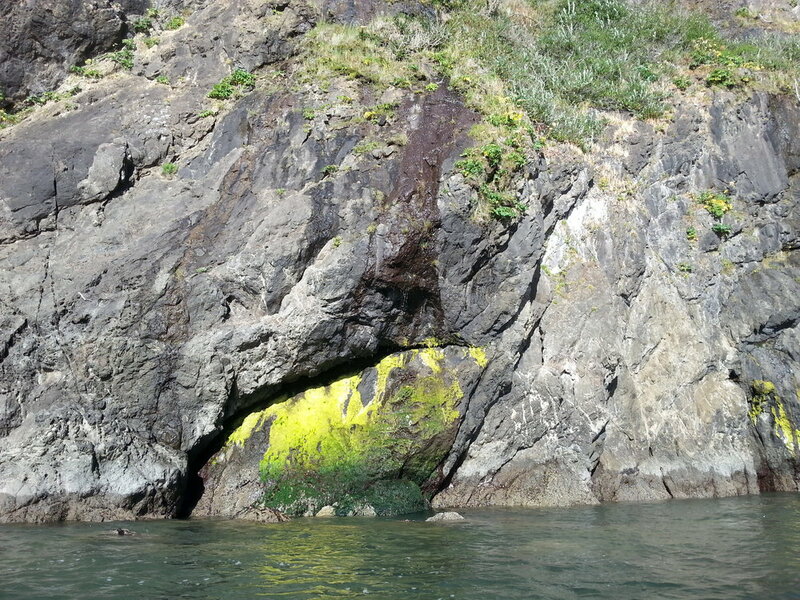 We saw so many beautiful, brightly colored seabirds when we were out; Olivia really enjoyed that part of the trip. 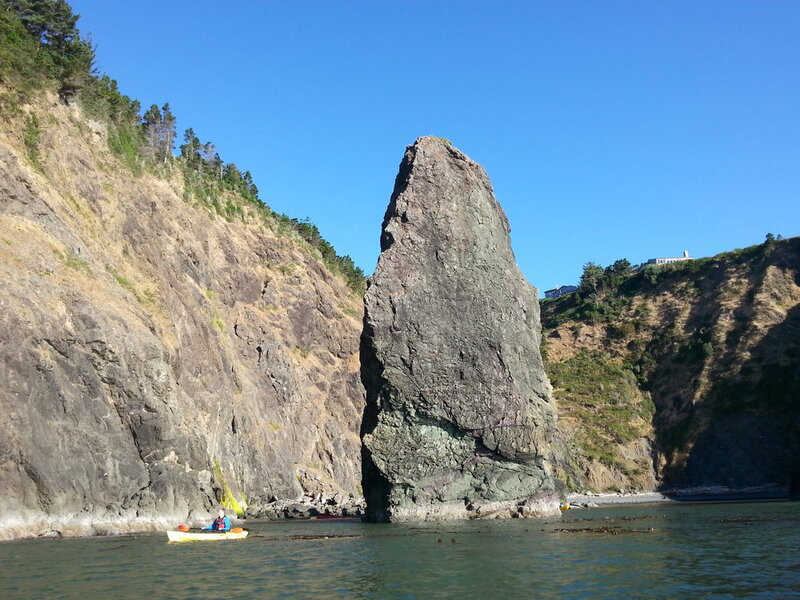 Once in our kayak's we headed straight out from the beach by the Port of Port Orford sticking pretty close to shore. 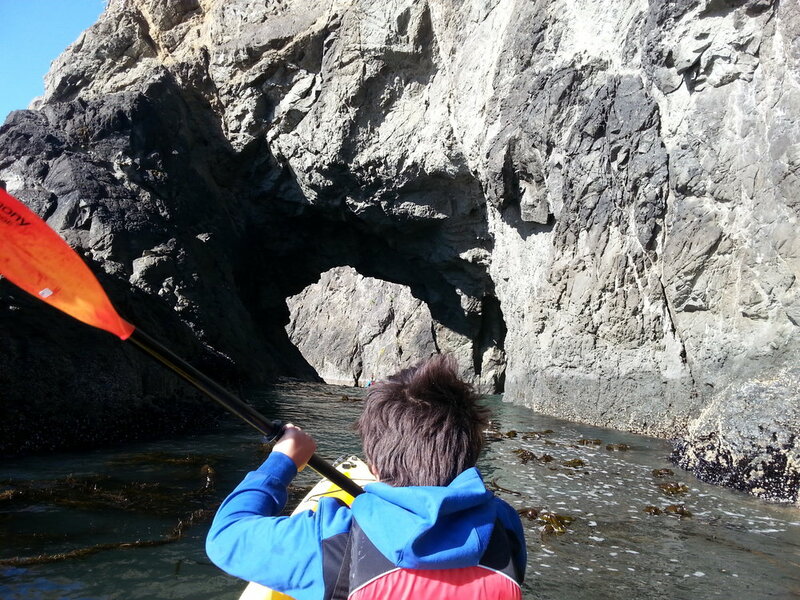 I ended up bringing up the rear because I was basically paddling for both myself and Ilias. It was fun, but slow going. 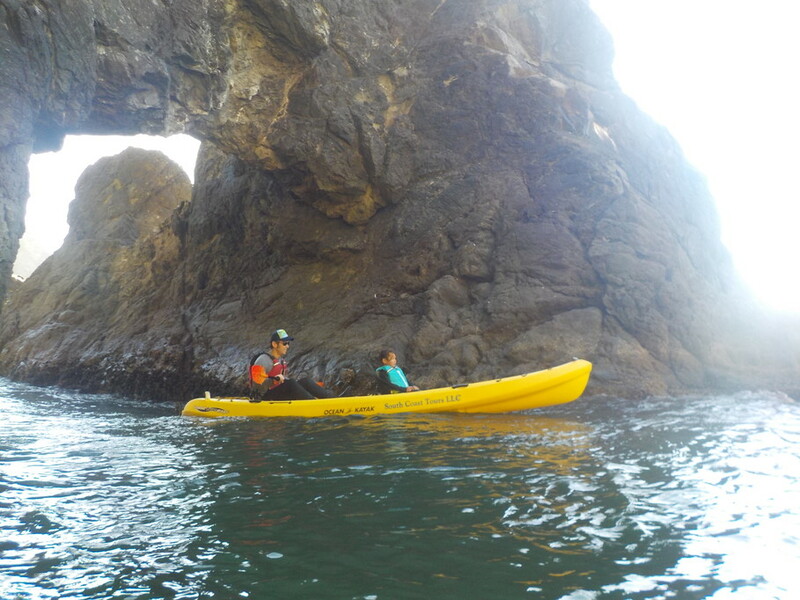 We kayaked into Graveyard Point and then into Tichenor Cove and then Nellies Point where were given the opportunity to go into a sea cave. It was kind of cool because the best way to go into the cave was backwards because obviously you need to come back out and it is a cave, so there is only the way you went in to come out. On the way out of Nellies Cove we were each given the opportunity to go through the Aquarium Arch (named by South Coast Tours owner Dave Lacey), but only after Alison checked to make sure that it was safe enough for us and we wouldn't get caught in a wave breaking while going under the arch. Once we got the all clear each one of the eight of us on the tour went through. This was Ilias' favorite part! 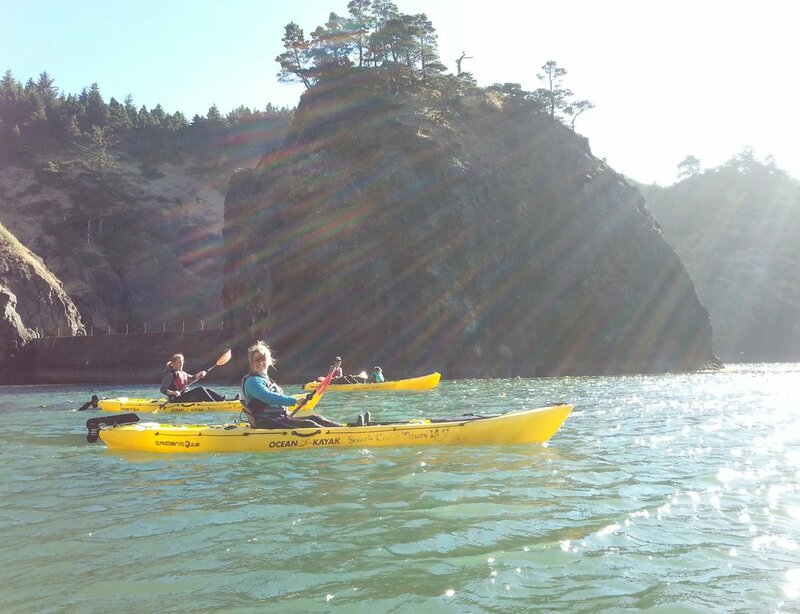 After that we rowed into one more cove and then turned around and headed back to our home shore. When we were heading back to the Port beach we were paddling against the wind and honestly we were having a rough time of it so Anthony was nice enough to tow us the last 1/4 mile. We were really straggling so it was great to have the extra help to get us into shore. All together the trip was about 4 miles long in 2 1/4 hours’ time. Olivia loved it even falling asleep towards the end as Gary rowed his way home. Ilias got really tired the last half so the help from Anthony was welcome. 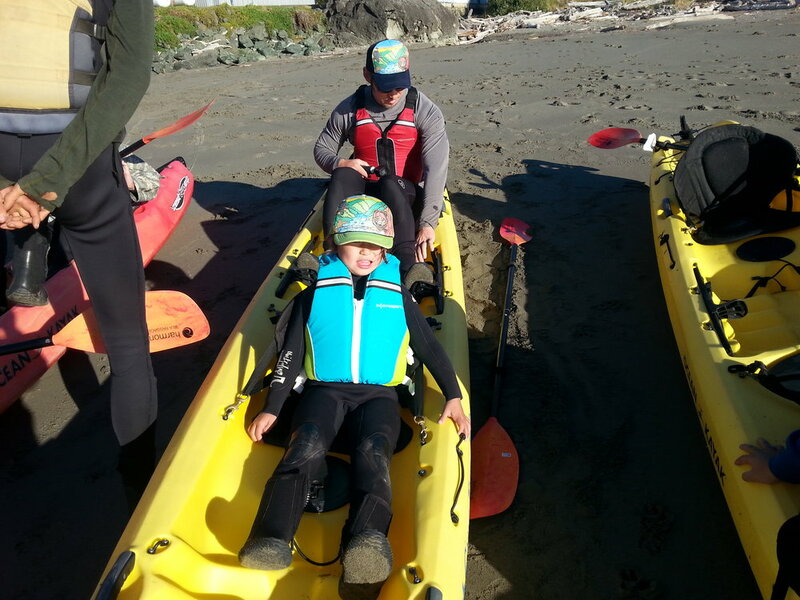 In hindsight I should have thought of the ocean wave factor and for the first trip out with the kids I probably should have booked maybe the South Slough Coos Bay or Bandon Coquille River Tour. The waters would have been easier for both Ilias and I to navigate. Make sure to wear a waterproof coat if you are going out on the ocean. They do have some to lend but I'm sure you would rather wear your own coat. If you get event the teeniest bit motion sickness make sure to take some motion sickness pills. The waves were pretty gnarly out there so you wouldn't want your trip ruined by you getting sick. If you want to take a smaller one like our 5 year old Olivia, make sure that they can sit for 2 1/2 hours straight without moving. We take Olivia out kayaking and paddle boarding so we knew that she would be fine. Other than that, have a blast. 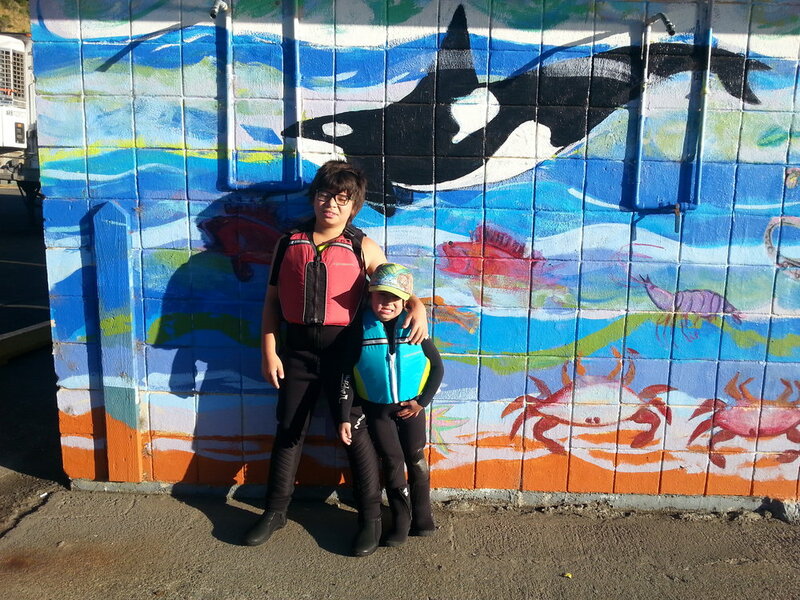 This was an awesome experience that we definitely want to experience again, though next time we will probably try one of their SUP tours or Surfing lessons! Want to know more about South Coast Tours? Head over to their website HERE for more details about what other adventures they offer pricing and anything else you may need to know!